Hello everyone and Happy Halloween!! Can you believe this is the very last day of October and tomorrow will be the first day to the second to last month of the year?? That was a mouthful! Well, I always look forward to the beginning of a new month because it bring a new set of gorgeous stamps to create with each month, and hopefully inspire you! Today, we are sharing with you a special set in a series of sets that are part of the Taylored Expressions Giving Tree. As always, this set is a full set of deeply etched rubber mounted on EZ mount, ready for your acrylic blocks! There are 27 images and sentiments, and don't forget, it coordinates with the original Labels of Love set AND the Ribbon Tags Trio Die. Also, our very own, Taylor, designed these sets for her TE line of stamps. For my sample, I used some pretty paper from the TE store, the MME Lost & Found Blush coupled with some yummy Carnation Pink Silk Ribbon. I used two dies, the Ribbon Tags Trio (of course!) and the Medium Scalloped Border Die. Now, I hope that you can hop around and visit the rest of the Baker's Dozen to see what they've done with this adorable set! AND!! We also have a new Baker, Jen Shults, has joined us, so please give her a nice warm welcome!! Alrighty, that's all for me (for now!) Off to dinner with the fam, and hopefully, more creating! Even though Halloween hasn't even come and gone yet, I've been saying a lot of Christmas projects starting to sprout up in various places. And well...I love it!! I decided to join in on the party and make myself a little shabby number, just because, I miss it! I kid you not, I have been studying feverishly since Anatomy class started on August 22nd, and my time to craft has been sooo limited. I feel like I'm never a step ahead and just barely treading water to stay afloat! I'm happy to say, however, I've made A's on my first two exams and I've actually really enjoyed the dissections! I'm currently studying the heck out of the brain...for us not knowing much about it, there sure is a LOT already known...and to be memorized! Anyway, enough of me sharing about my class! I think my friends get a little tired of me talking anatomically now too, LOL! I didn't get to play with the layered part of the Trim the Tree die for the release, so I got that sucker right back out and got to playing. :) I, also, still had elements from my release projects laying across my desk, so I just used what was out...for the most part! The patterned paper is from Crate Paper's Peppermint 6x6 pad that I had purchased from the TE store. I embossed my card base front with the Musical Swirls Impression plate and then added some distress ink so it would really stand out. 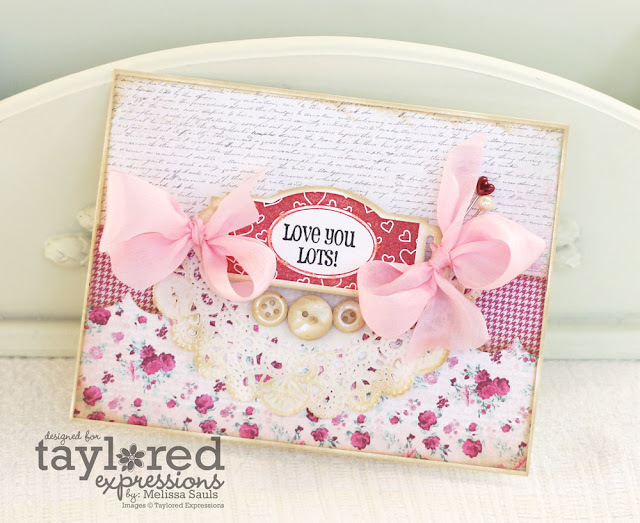 I also used the Small Scallop Border Die that you can see peeking out from the texted patterned paper. Finally, the stamp set is from the new Banner Holidays, and of course, paired with the It's a Banner Day 3 stamp set and Banner Day 3 die! And that just about sums up this number! I love it! Right up my alley and the most pleasant break from all the studying!! I'm hoping to squeeze some more time soon to just do a nice little marathon of crafting. I have another exam next week, and of course, I'm already preparing for that one....the stress begins a full week before it happens! October is Breast Cancer Awareness Month - you can help support the Susan G. Komen Foundation through the purchase of Moka Hope (insert direct link to stamp set). Plus you can donate cards to the UT MD Anderson Cancer Center through Hope You Can Cling to at SCS. Woohoo!! It's Thursday, and it is now official! All of the stamps and accessories you have been seeing the past few days are now available for purchase!!! But before you set off to shop, we have some final projects to share with you. So have you gotten some good inspiration this week? I hope so!! There is still more to see. Please stop by the following blogs for even more eye candy!! We have sneak peeks to share Monday through Wednesday. All of the new products will be available for purchase on Thursday, October 6th at 8 am PST. 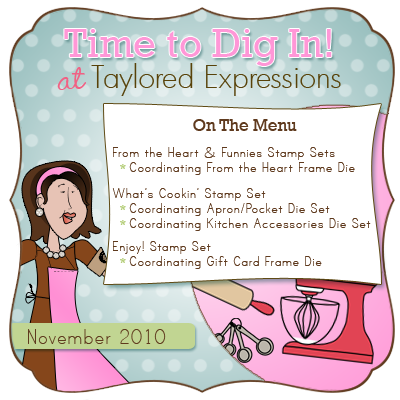 You'll find it all in the Fresh out of the Oven Department at the Taylored Expressions Store. Mystery Baker's Dozen Blog Giveaway: Each day, one lucky blog commenter will be chosen by random draw to win a $10 TE Gift Certificate. Winners will be chosen from a different Baker's Dozen blog each day and will be announced on Taylor's blog on Release Day! Be sure to hop around to see all the sneak peeks and leave comments on each and every blog for more chances to win. Limit one comment per blog per day, please. Comments close Wednesday 10/5 at 7pm PST for the drawings. Hello again everyone and welcome to the last day of sneak peeks before the big release tomorrow morning!!! I'm excited to share my contribution to the last grouping of sneaks, and I think this is a set that you have been anxiously awaiting! Remember the Seasonal Wreath sets for all of the various seasons/holidays? Well, the holiday/Christmas one is finally here!!! I made a couple of very Clean and Simple easily mass producible cards...check it out! The wreath is from the new set, Wreaths of Joy, and normally, there would be one wreath to the set, but they couldn't stop there this time!! The holiday wreaths are just too cute, and so they added another! Ack!! Isn't that too cute?!? You can go with fun and whimsical with the ornament wreath, and/or elegant and classy with the holly and berries wreath. This was illustrated by Nancy McKinney for her Whimsical Wishes line of stamps and features 13 images and sentiments on a sturdy panel for $12.95. And of course, it coordinates with the Seasonal Wreath and Basic Bow die. Now, even though my card is pretty clean and simple, I paired it with a couple of dies, the Seasonal Wreath and the It's a Banner Day 1 die on my first card, and It's a Banner Day 3 on my ornament wreath card. The sentiments are also from a new set... the Banner Holiday set. This set has the perfect holiday sentiments that coordinate with all three It's a Banner day dies...1, 2 and 3!! Banner Holiday was designed by our very own, Taylor VanBruggen, and features 15 holiday sentiments on a sturdy square CD sized color panel for $12.95. Can you see where my first card has the impression deep into my card while the 2nd one has the impression raised? I love how you can use two totally different effects for your cards! Ok, that is it for me today! I will be back tomorrow to celebrate the big release in the morning and share one last project for ya! :) I hope to see you back here, and don't forget to take a look at what the rest of the ladies have to share with you. Hey everyone, and welcome back to Day 2 of sneaks for the big release in just TWO days!!! I'm very excited about the sneaks today as we are featuring some of my favorite sets from this holiday release! Half of us will be doing projects with some adorable tags, while myself and the other half will be featuring projects with the very lovely set called, Peaceful Poinsettia. This is another set illustrated by the equally lovely, Nancy McKinney for her Whimsical Wishes line of stamps. 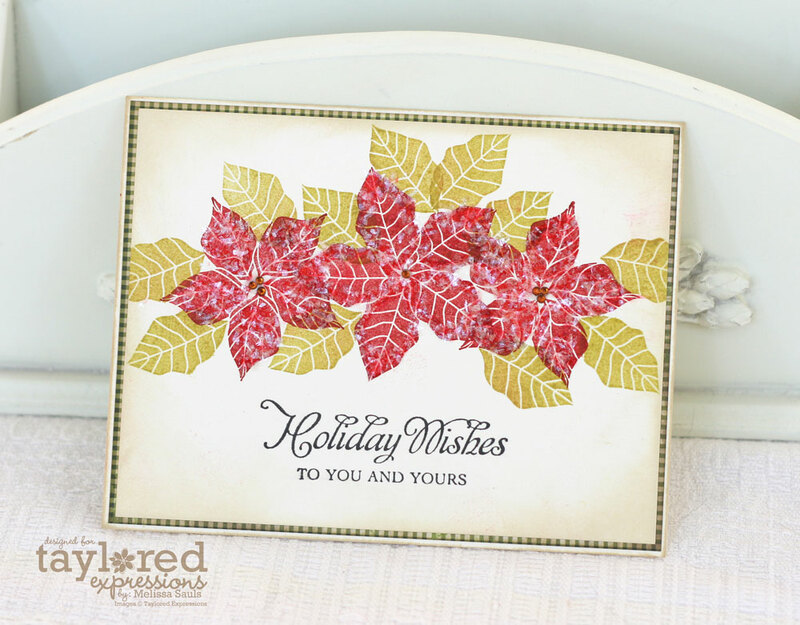 Peaceful Poinsettia gives you options for either open line and/or solid stamping. And of course, they look beautiful layered..just like a real poinsettia! 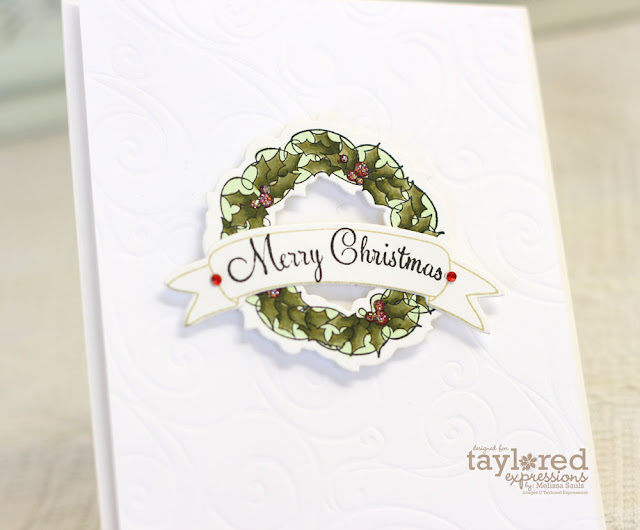 The coordinating Poinsettia Taylored Die makes that soooo easy to achieve! I created a project using the open line stamps and then colored with Copics and then die cut out for layering. Now, I went with a card that is very easy to mass produce here! There are two holiday Project Pantries, and yesterday I used one, and today, this is the other. When you want to bake up a yummy dessert you head to your pantry for the ingredients. When you want to create a sweet papercrafting project, you can head to our Project Pantry for all the coordinating elements. We've found that some of the best cake and cookie recipes are the ones based around a basic batter or dough recipe with lots of options to spice it up according to your tastes. Taylored Expressions is offering our Basic Recipe Kit along with optional Spice It Up Ingredients that you can pick and choose from to build the kit just the way you want it. I also paired a couple more dies to showcase my holiday sentiment, Frame It Up 1 Taylored Die and the Take Note 2 Taylored Die. I love how the dies can pack such a punch and make card making for mass production so easy! Now, be sure to check out what other projects we have in store for you today, and don't forget to come back by tomorrow and visit for MORE sneaks! Hello everyone! So glad you are joining me for the beginning of October (YAY!!) and also, the first day of sneaks for the Taylored Expressions big release this coming Thursday! This month is all about Christmas and boy have I gotten myself into the spirit! To start, all of the team and I are featuring projects with the cutest little winter and holiday set, Woodland Winter. This set features the cutest little critters to make an adorable holiday/winter scene! This set was illustrated by Doug Applegate for his line of stamps, Apple Doodle Ink. It is a set of 21 images and sentiments on a sturdy 5.75" x 8.5" sturdy panel, and of course, features that lovely deeply etched pre-trimmed rubber on ez-mount ready for to stamp with your acrylic block! 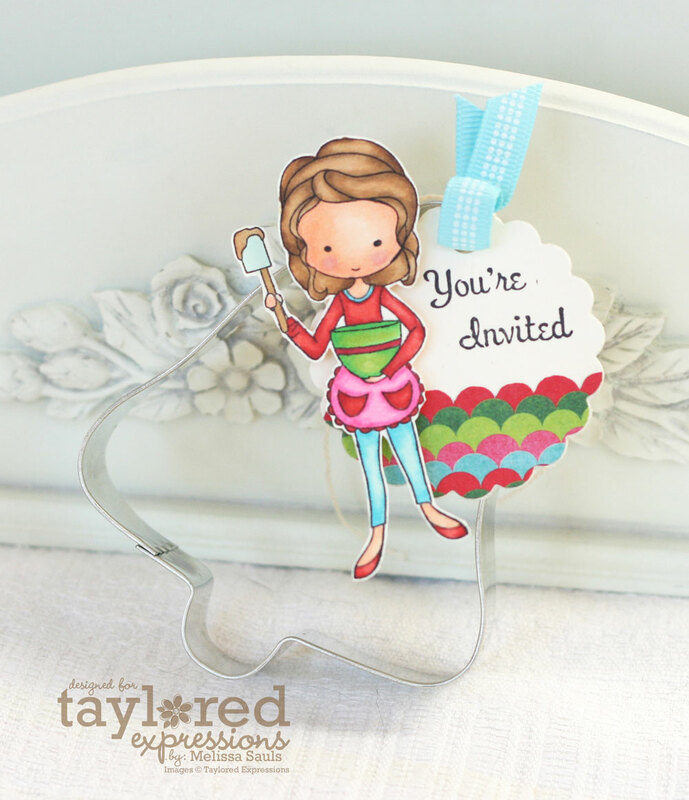 And of course, there is an ADORABLE die to match...the Trim the Tree Taylored Die set. Check it out! I actually didn't create a critter scene (today! ), but I did use the tree (with die!!) and the Christmas gifts under to make myself a sweet little Christmas card. The papers and accessories came straight from one of TWO new holiday themed Project Pantry kits called the 12 Days Project Pantry. Here is some info on the kit I used above...and in my next project! And finally, there is another Moka being shown this month called, Moka Hope. October is Breast Cancer Awareness month and Taylored Expressions is donating $1 from the sale of each Moka Hope set to the Susan G. Komen Foundation. You can see the adorable stamp set in full and more details on THIS post on Taylored Expressions blog. This little set is perfect for all types of encouragement cards and while it was designed with breast cancer in mind, her ribbon can be customized to any color for any cause or disease. And that wraps up the sneaks for me today! Don't forget to come back right here tomorrow for more sneaks for the big release on Thursday. And also, don't forget to visit the rest of the Baker's and friends today to see what they have in store for you!